I am in the process of redecorating our guest bedroom and bath and linking up with 71 other bloggers courtesy of Calling It Home. If you missed the previous weeks ... you can catch up here. This week for me was the biggest change by far!!! The rooms are painted and I am thrilled with the color results!!!!! If you follow me on Instagram you know I am in the process of redoing a 11 year olds bedroom with my dear friend Laurie of Laurie Byrne Originals. You may have seen snip its and pics posted ... but I figured this would be the best forum to share the entire story of how the room redo came to be! I grabbed a $30 can of paint at Home Depot. Once again I must say ... I am loving this 6 week makeover! Its such a feeling of accomplishment to know I can break things down and only have to accomplish a few items a week. 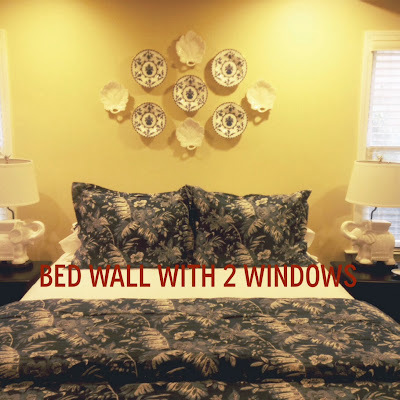 I am in the process of redecorating our guest bedroom and bath and linking up with 71 other bloggers courtesy of Calling It Home. If you missed the previous weeks ... you can catch up here and here. 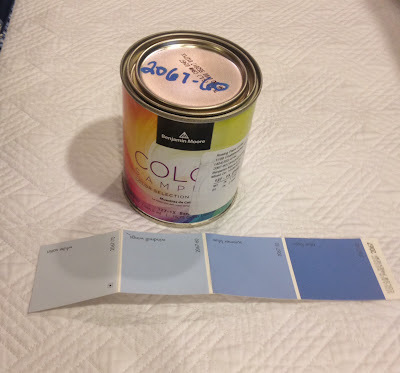 I had a plan this week to paint both the bedroom and bathroom. But, of course the best laid plans never work out. So I scratched that plan and made a new one. Moved painting to week 4 and week 4 to week 3. 1. I have scored all the art for the rooms. At least I think I have ... of course on week 5 when I am styling I will decide I need more. I will think about that then! 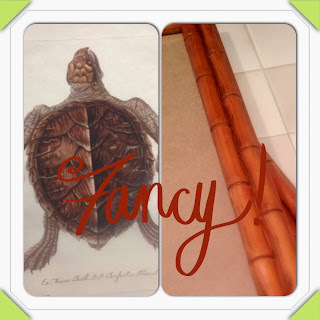 These turtle prints were scored at Scott's Antique Market on Friday ... exactly what I was hoping for! Paired these with bamboo frames I already owned and perfection! 2. Tested out the paint for the spaces and love them all!! Love the blue in the bedroom! 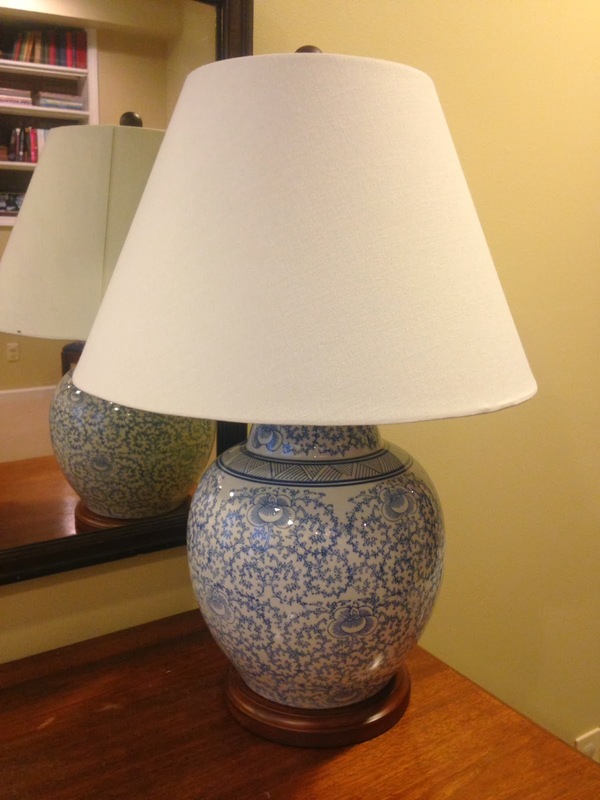 Its a perfect play off the Ralph Lauren lamps. I am loving it with the bedding! Hello blue ... goodbye flu looking wheat, yellow color! And the glossy blue on the cabinets will be amazing!!! 4. 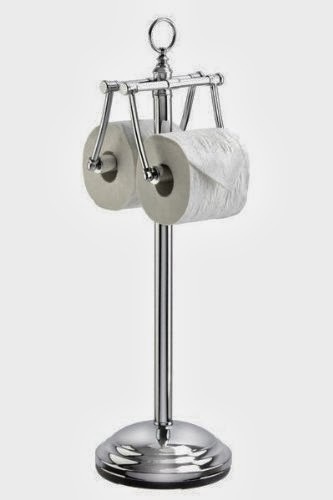 Ordered this toilet paper holder for the bathroom. 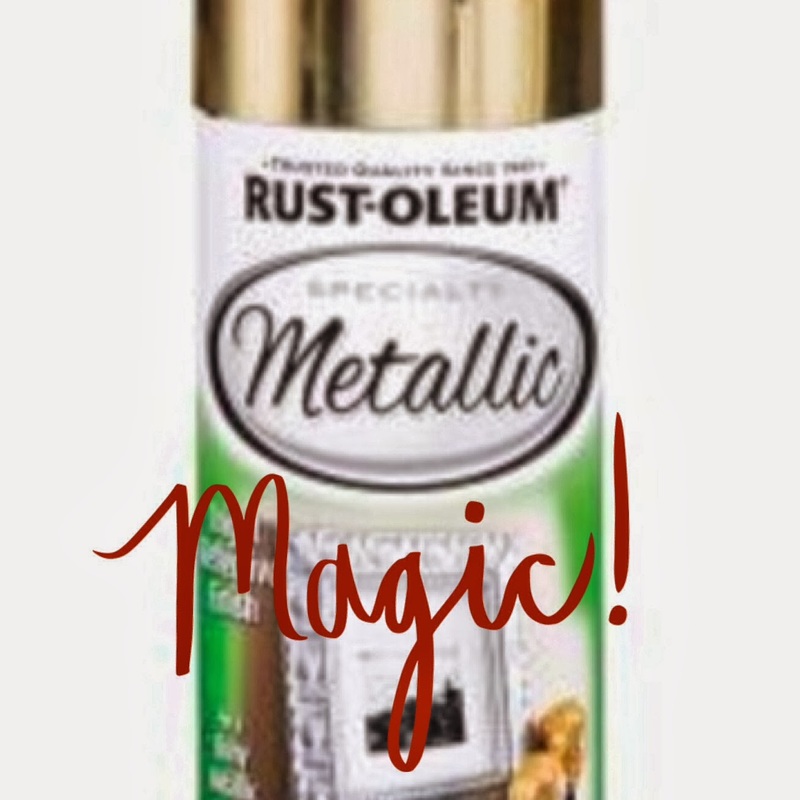 Some gold spray paint and it will be perfect! 5. Purchased two more cans of this Magic paint ... can never have enough spray paint! This week was all about painting things gold. 6. 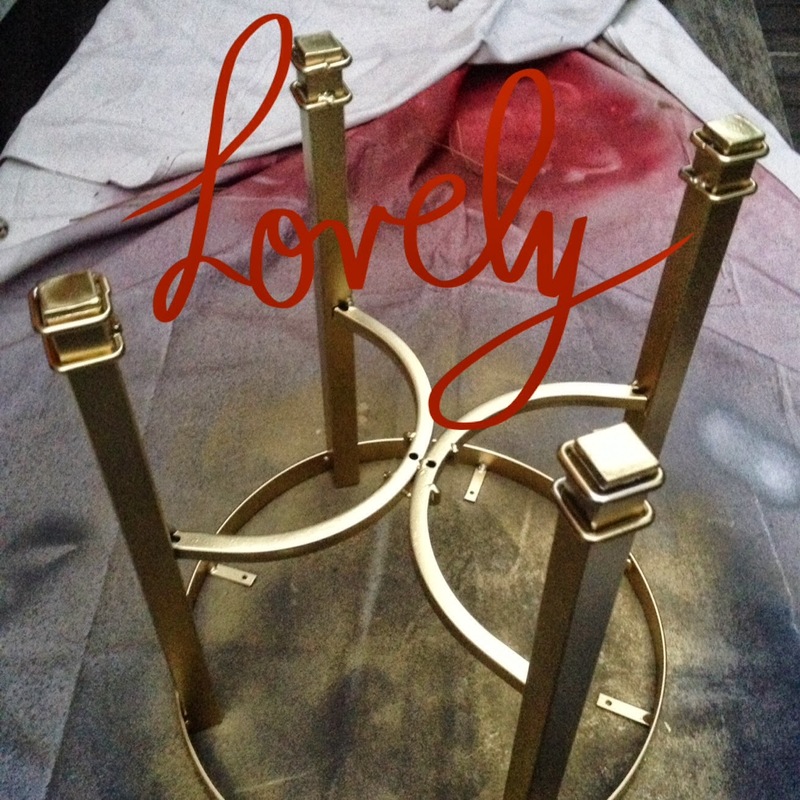 Took apart the plain Jane stool I purchased at Home Goods and prepped it for the bathroom! And HELLO LOVER!!! I am madly in love with the result! One $30 plain stool made fancy for my new guest bathroom! I know I am biased but I can't stop staring at it! 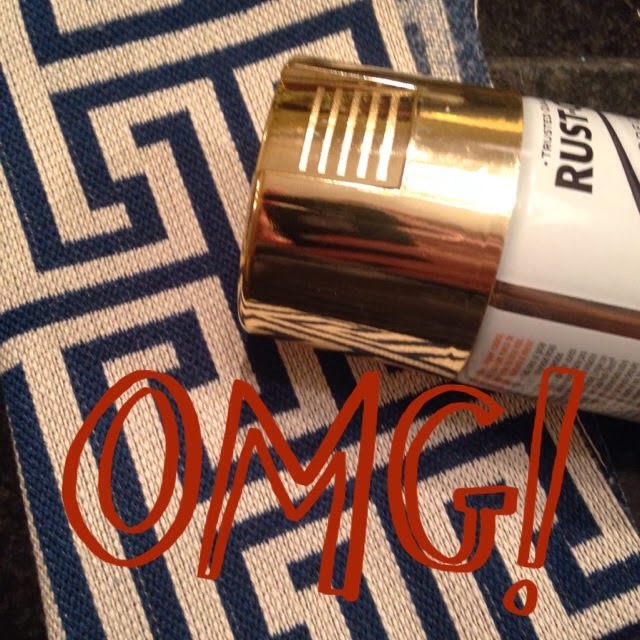 I love how the details of the stool pop with the gold paint! Yes, I monogram almost everything. And yes its MY monogram. I am the lady of the house and its the old school way to do it. The bar ware is all his monogram, along with his pillowcases and his towels. He has plenty of monogram face time, pinky swear! I am thrilled with the bolster pillow ... absolutely thrilled! I am overjoyed. Absolutely thrilled. It's ridiculous good!!! And I took it back to the upholsterer. It is currently getting its blue leopard seat. I can't wait to pick it up and set it in its newly painted room next week. 9. Lastly ... 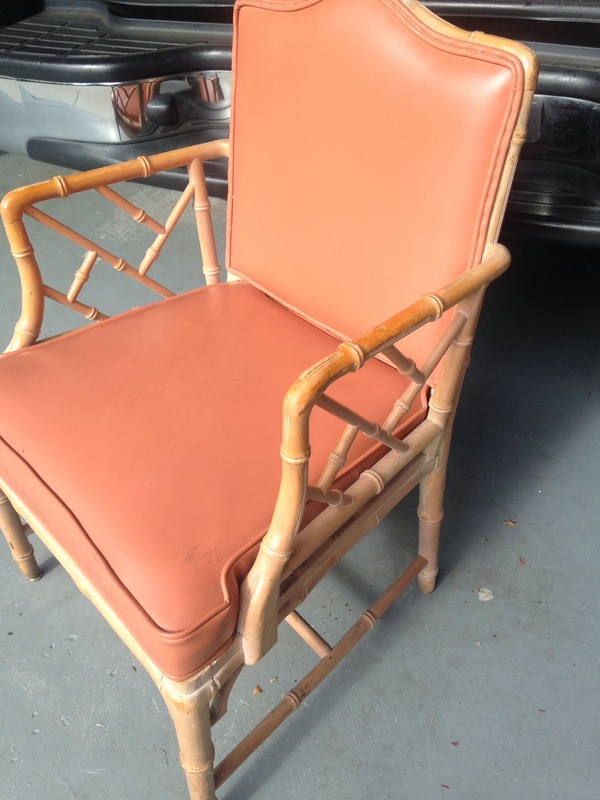 I scored this fabulous garden stool to set next to the gold bamboo chair. I will divide up the books I have set aside for the room and sit some on top of the stool. I could not be happier with the results so far. I really think once the paint is finished the room will feel way more pulled together and then I can start on the panels, shower curtain and moving the furniture into its new place. And of course the wheatish, yellow, fluish color will be no more! See you next Thursday for Week 4!! Part of my daily routine is reading design blogs. I love to sit with a cup of coffee after the kids head to school and peruse blogs. 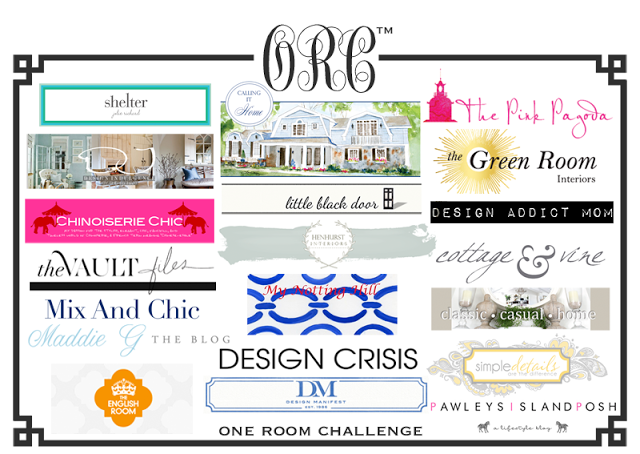 I have my favorites on my blog roll and I get so excited when I discover a new one. I find it relaxing and incredibly inspirational. This week while I was knee deep in my blog reading routine I happened across this picture. I can't recall which blog I found it on or I would credit it properly. There are so many things I love about this picture. 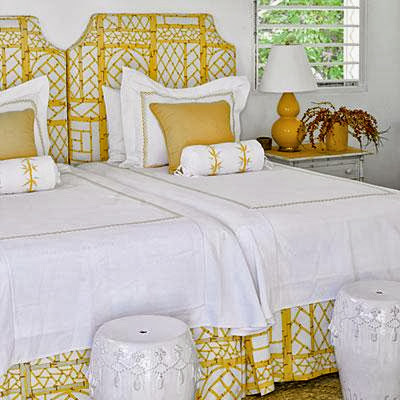 The mustard, the bamboo, the matching twin headboards made into a king, the garden stools ... I could go on for days! And then I found this picture on Brittany Makes. And there are so many elements of this picture I simply adore. First of all, her laying is perfection. 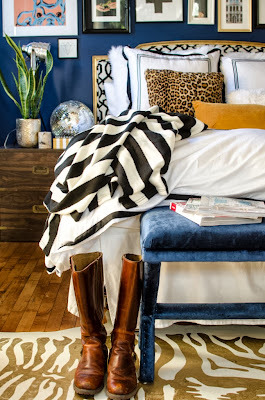 The mix of prints, even in the boots and scarf tossed on the bed make me swoon. I am pretty sure Brittany rocks. Like rocks my world. She made those X benches, not just covered them. Made them. From wood. She is my hero. Of course now I can think of nothing else but X benches at the foot of my king bed. I will have to file that idea for the week after I finish the One Room Challenge! After staring at her master bedroom picture for longer than I will admit ... I realized something. I "needed" some fabulous layered shams for our bed. 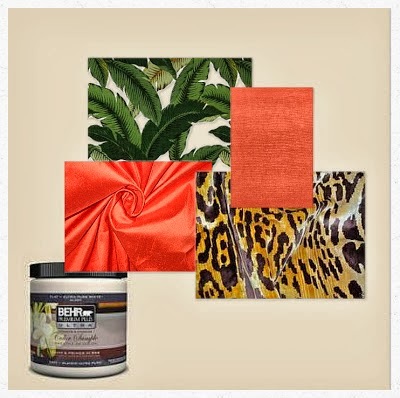 I love so many elements of our Master bed. I love the headboards, love the duvet, love the Matouk bamboo at the foot ... but the shams need serious love. 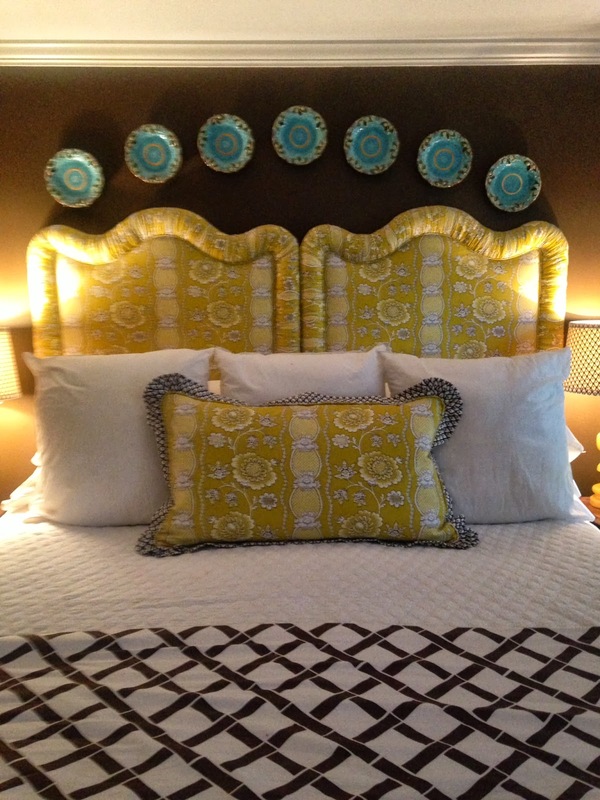 Yes, we have euro pillows on the bed, but if you saw them in person you would realize they don't have shams. Yep, they are just props. I am desperately seeking more Matouk chocolate bamboo to finish our bed. 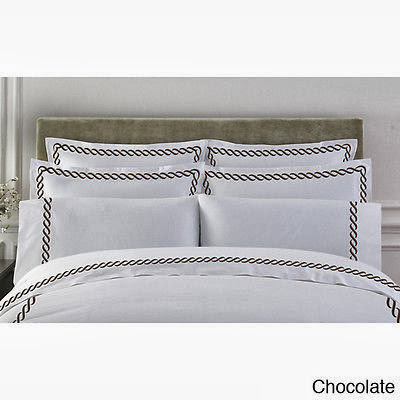 But after stalking looking at Brittany's bed I discovered I would be just as happy with a chocolate link Euro sham and two Matouk standard shams. After some Ebay shopping ... I happened upon these. Once these euro shams arrive and I pop a monogram on them ... I only need to find one more Matouk bamboo standard sham and the bed will feel complete! Oh yes ... after I made some X benches. Its time to become BFFs with Brittany! The best part of the One Room Challenge for me is seeing all the transforming rooms. I love it when they go from blah to Holy Fabulous!!! 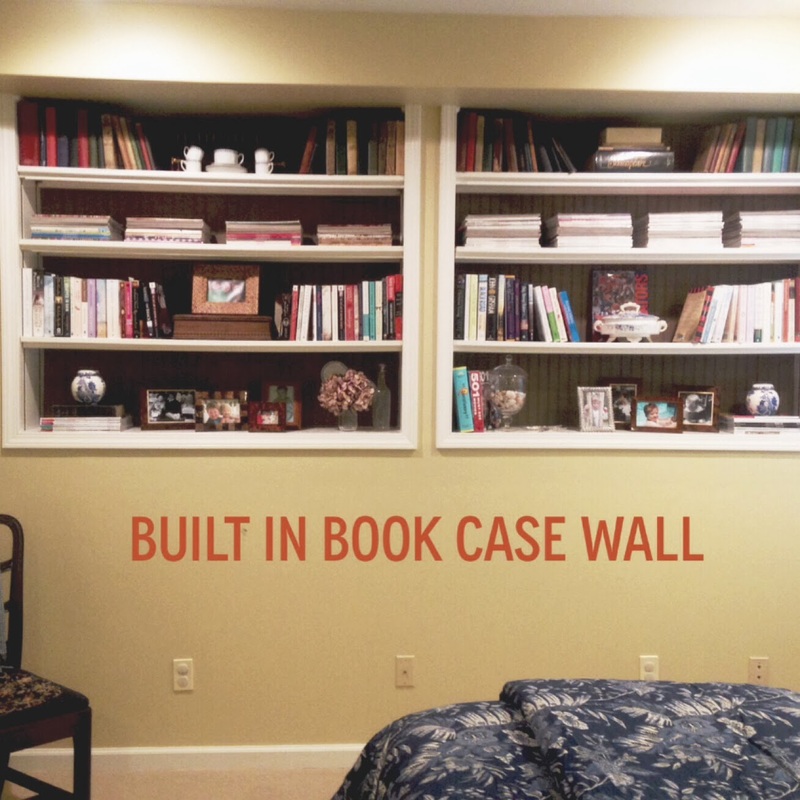 I also love the stories behind each room. The budgeting, the scores and most of all the DIYs. 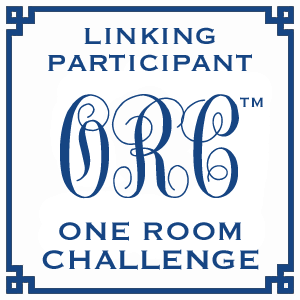 First there are the 20 original ORC partners! I am a daily reader of Calling It Home, The Pink Pagoda and Chinoiserie Chic and I can't wait to peruse the blogs of the remaining 17. And then there are the 72 linking partners! Can you believe it?? Yes, I said 72!! Kimber is transforming her master suite from a white box to an amazing Oly inspired picture of fabulous!! I love her honesty, her humor and her post about painting her boring back splash tiles in her kitchen might be the most amazing thing I have seen in a while. And please note .. 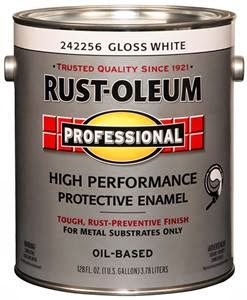 I will be painting mine this weekend! This laundry room make over is ridic good!!! I love every single element Frances has pinned. It makes me want to gut my laundry room and start from ground zero. Luckily for Lawyer we don't have the space to make that dream a reality!! Ok ... this may be my new favorite blog!!! Ashley is amazing and her bathroom makeover is stunning!!! This picture includes her newly installed hand painted silk "faux de Gournay" wallpaper and 2 newly installed vintage sconces. I can't get enough of this room. She saved a bundle by ordering these hand painted silk panels from Ebay and her investment paid off in spades!! I am incredibly inspired by each and every participant in the challenge. It takes a lot to commit to six weeks of work in the busy lives we all lead!! I hope they are as excited as I am to complete my room and reap the rewards! I am enjoying every second of this 6 week makeover! I am in the process of redecorating our guest bedroom and bath. If you missed last week ... you can catch up here! I will admit I was incredibly nervous to commit to and even to start the process, but now that I am two weeks in I am getting more and more excited for the reveal! EEK!! Now the hardest part for me is waiting ... waiting to work on certain items each week. Typically when I am working on a project in the house I just work for a week or so until its all done. Yes, I know patience is not my thing! First, I owe you better pictures of the bedroom, then you can wipe the previously posted before pic from your memory! No more flood chic! Here's where I started. 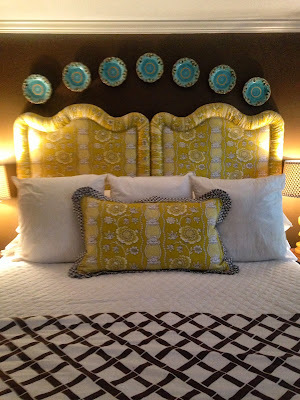 Good bedding, cute lamps, like the plates ... but the rest just seemed dull to me. Need a punch, some caffeine, something that said Guest Retreat! 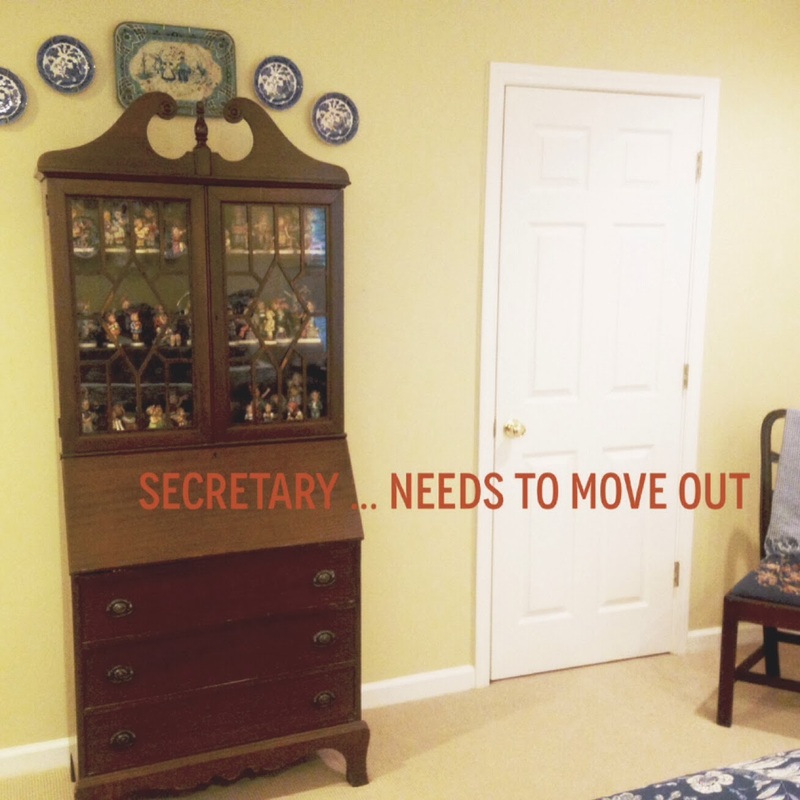 I love this antique secretary, it was my grandmothers. But in the new space I need a chair and possibly a coffee station ... something that would be a better fit for my Guest Retreat. These built ins get on my last nerve. The people before us used this room as an office and his desk was on this wall. When we moved in I added the bead board and painted it chocolate. It was a good change at the time, however I'm done with that now and need it clean and updated! Good wall ... but not great. 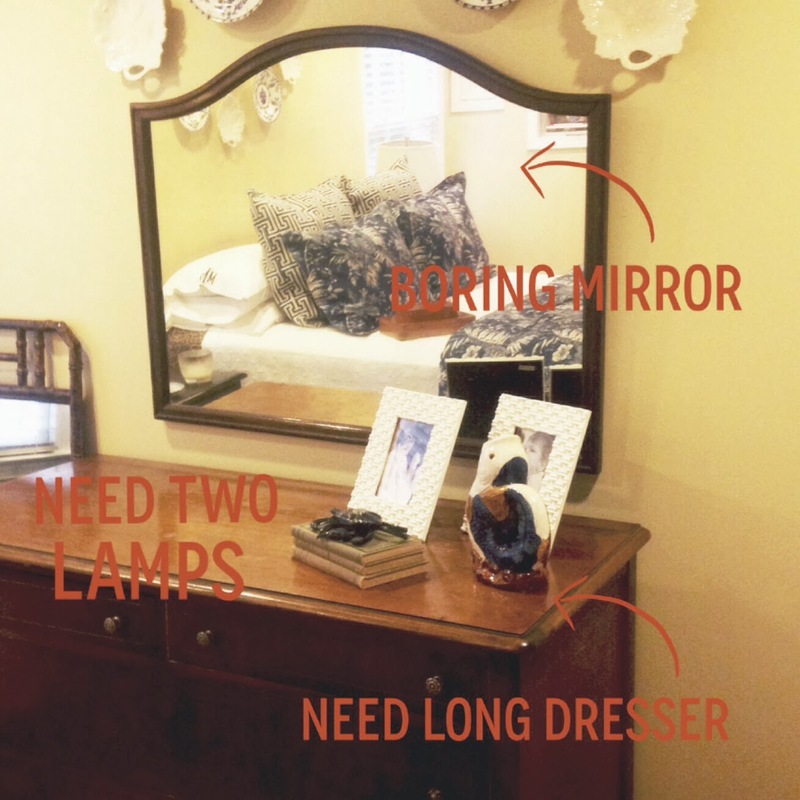 Dresser is too short and that mirror needs to go STAT! My Guest Retreat needs a longer dresser and 2 fabulous lamps!! 1. I found two fabulous Ralph Lauren classic blue and white ginger jar lamps!! 2. 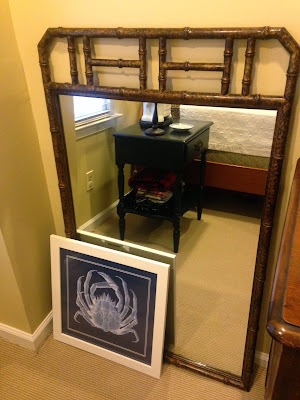 I scored an amazing vintage bamboo mirror from Details Atlanta for over my long dresser! Dara was so great. I just sent her my inspiration photo and she sent me this option. And its perfect!! This new mirror will give height and character to the dresser wall of the room. EEK! Also found that fabulous little crab print. I am still on the hunt for a coordinating print to place them on either side of the mirror with my turtle shells. If I don't locate one then he will find his home in the bathroom! 3. 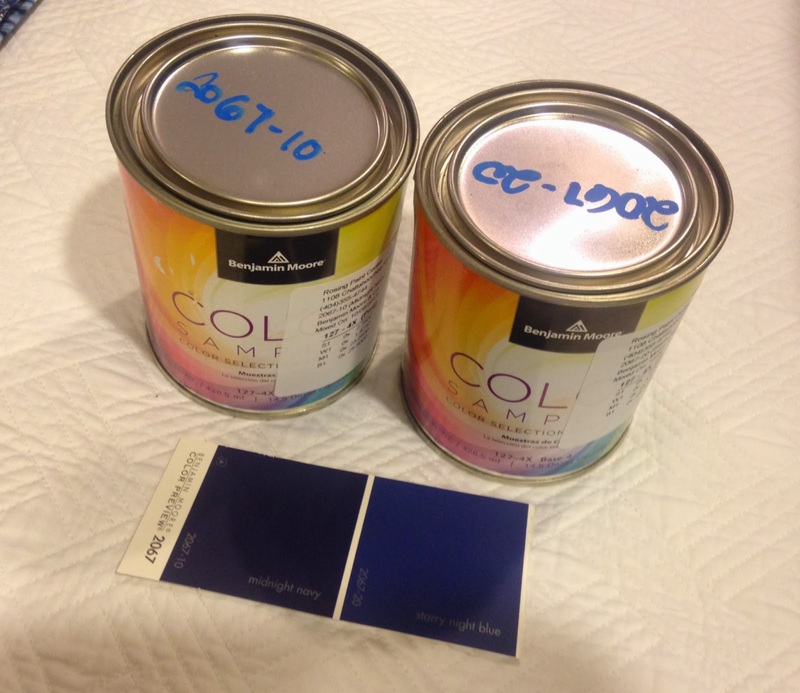 I grabbed samples for the paint colors I am thinking of using. The room and bathroom along with the bathroom cabinets will be painted next week. 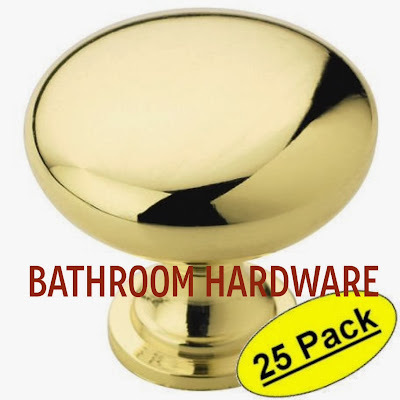 Bathroom cabinet colors ... I am leaning toward the darker navy, but we shall see. This sample is perfect. The wall color will be the second from the left! 4. Picked up the completed euro shams! Already the bed has more pizzazz!! 5. 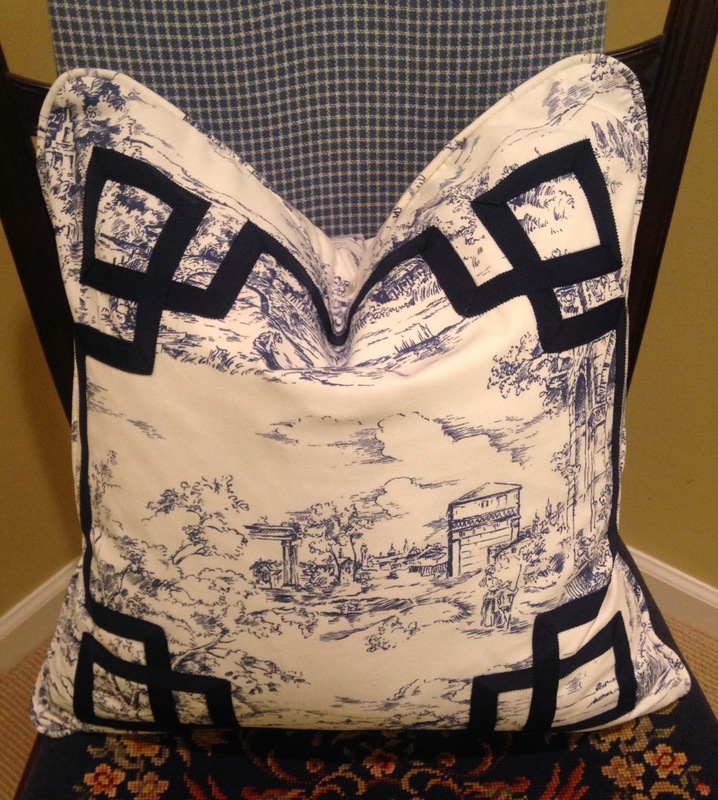 Picked up the completed accent pillow for the new chair! My upholsterer may not be speaking to me after all this fretwork, but it was worth every single penny!! 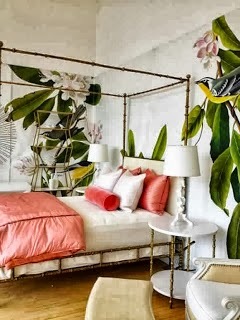 This is exactly the look I wanted for the room!! 6. 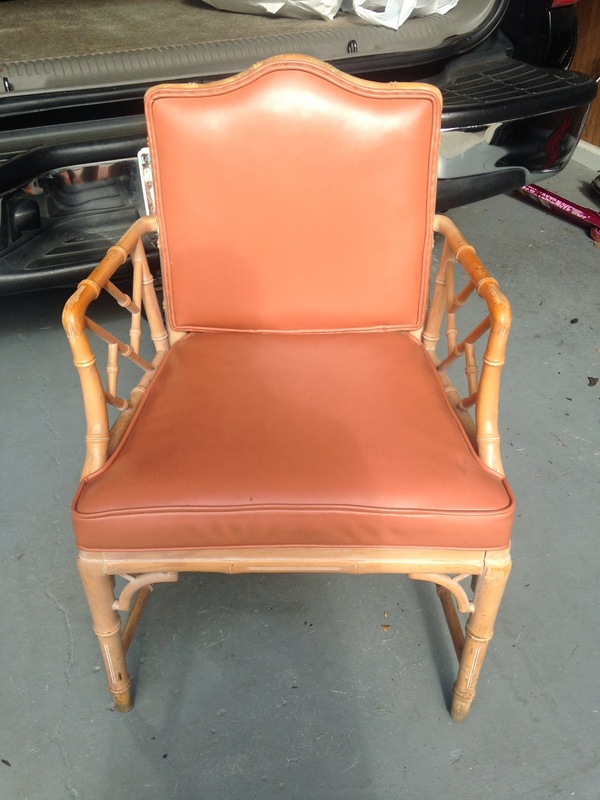 Scored a great chair also from Details Atlanta!! 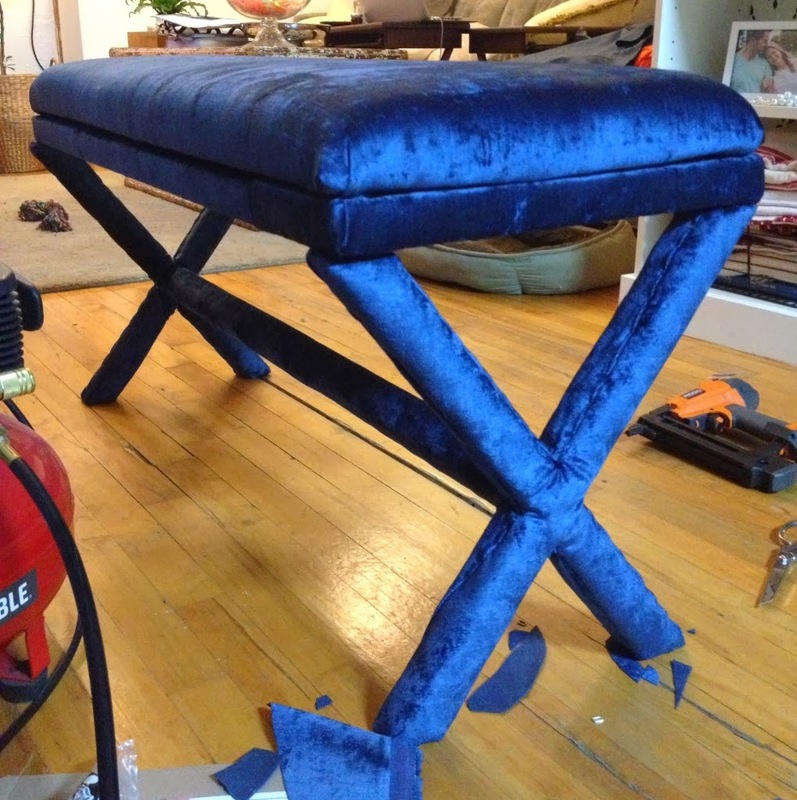 Some paint and some new fabric and it will be the perfect touch! Good start for week 2. Once the room is painted next week I think the change will seem more drastic to me ... I so need to ditch the yellow/wheat color in the room that is making my pictures look like the room is covered in the flu! See you next Thursday for Week 3! !